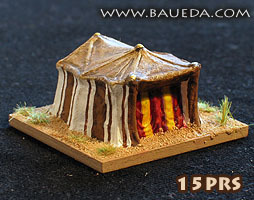 15mm Persian tent AVAILABLE NOW! 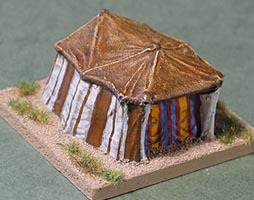 This tent is designed to be suitable for any Persian army. 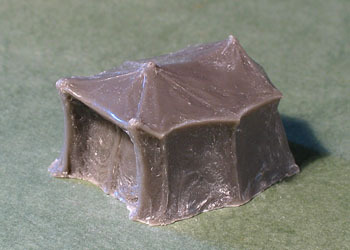 The model is about 30mm wide, 38mm deep and 20mm tall. 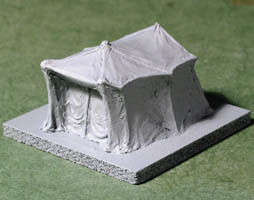 15PRS is available in three finish: simple plain cast, as it comes out of the mold; cleaned and primed, based and ready to paint; or as a finished DBM baggage element, painted, based and flocked to the very same standard you see in the picture! Want this model pre-painted, based and Ready-to-Play? Click here!